You know the scenario, you head to the fuel dock to fill up with fuel before heading out, and believe that you will be able to control the inrush of fuel from the pump. You think that you'll be able to let go of the trigger in time, so that the fuel won't back up and spoil the decking. But once again you fail and then have to spend the next 20 minutes or so mopping up spilled diesel from the deck using almost an entire roll of paper towels in the process. No one likes to spill fuel, it smells bad, stains teak decking and any that gets in the water leaves a huge slick around the boat. Having owned both diesel and gasoline powered boats I have to say that diesel seems far worse in many ways than gas. Diesel has a predilection to foaming up and frothing all over the teak. The Clean Way Fuel Fill is in essence a baffled air vent which lets the fuel in and the air out. A snug fitting bung seals the fuel deck fill and any blow back foams up into the elongated funnel. Internal baffles prevent sploshing (is that a word?) and the clear plastic lets you easily see when the diesel starts to foam up, contained inside the plastic rather than all over your decks. I'll admit that the shot above is clearly a publicity photo, but it does show rather well, the Clean Way Fuel Fill from Scanvik marine. I've been trying this out recently, as they rather graciously gave me one to try, and I have to admit that it does work, and work well. By the way there is a video on their website which shows it in action. I can recommend the Clean Way, it does what it says, keeps the deck clean and prevents spills but there is another, cheaper, way. One trick I learned many years ago is that just before you fill up and remove the fuel filler cap, sloosh (another great word) a couple of buckets of seawater on the deck. Then, if any fuel does leak it will tend to float on top of the water and can be cleaned up far more easily than if it is allowed to soak into the teak or fiberglass. I've long had a fascination with electric power for boats. I can see that for many day sailors and those that do not venture far from the dock and a ready supply of shore power electric power is the way to go. I have actually been using an Minn Kota electric outboard on the dinghy for the past few years and have been very impressed. Light to store on the mother ship I don't have to mess with gas and the quiet is a blessing. To supply the power to the motor I use a portable battery meant for jump starting cars. I can plug in into the main ships charging battery when back on board and it charges up from flat in a couple of hours ready for next use. The whole outfit, engine and battery weigh less than the 2 hp Yamaha that I used to use. In fact I use the electric outboard so much now that I gave up with the gas engine and recently sold it. I do love the quiet and so do the neighbors on adjacent boats when I have to run the dogs ashore early in the morning. Although I have yet to try one out the Torqeedo motors look good at first glance. They have been out for while now and what sets them apart from the Minn Kota and others is that a detachable Lithium Ion battery is incorporated into the top of the motor itself. This means no cables in the boat with the engine as compact as a small gas outboard. 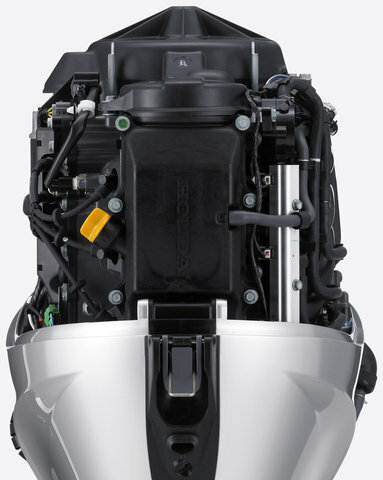 The 1003 model shown above has the equivalent thrust of a 3 hp gas engine the makers claim thus making it a realistic replacement for auxillary power on the back of a small day sailer, larger dinghy or RIB. Priced at $1900 it is not cheap but it does have some neat features such as a display built into the tiller handle showing the rate of discharge and remaining range based on the amount of battery juice left. If they can get the price down a bit making the engine more attractive to buyers then I can see that I will not be the only person in the harbor zipping around in near silent motion. Boaters may be getting a reprieve, at least for now of plans to increase the amount of ethanol in gasoline. Gas at the pump now contains up to 10% ethanol but the EPA was supposed to have decided by the 1st of December if they were to allow the use of up to 15% ethanol. Although newer outboards and other gas engines can cope with ethanol in fuel many older installations cannot. Ethanol often called E10 contains solvents that eat away at some flexible hoses, seals and other parts of gasoline fuel systems. If the ethanol levels increase to 15% then any problems may be exacerbated. The U.S. Environmental Protection Agency said on Tuesday it needs more time to decide whether to approve an industry request to boost the amount of ethanol blended into gasoline. The EPA was supposed to decide by Dec. 1 on a petition from Growth Energy filed on behalf of 54 ethanol producers to let gasoline contain up to 15 percent ethanol. U.S. gasoline is now approved to contain up to 10 percent ethanol, which is made mostly from corn. The U.S. ethanol industry was hard hit in 2008 by the economic downturn and a drop in crude oil prices to nearly $30 a barrel. Many companies were forced into bankruptcy and a large percentage of production capacity was idled. Although the EPA and other groups are most concerned with the effects on the auto industry little thought has been given to the boating community. Although the fuel usage is tiny by comparison with the amount of gasoline used in road vehicles many boaters found themselves with hefty repair bills when ethanol was first introduced into gasoline. Any increase in the amount of ethanol could have further serious consequences for boat owners. I'll keep you posted on developments. 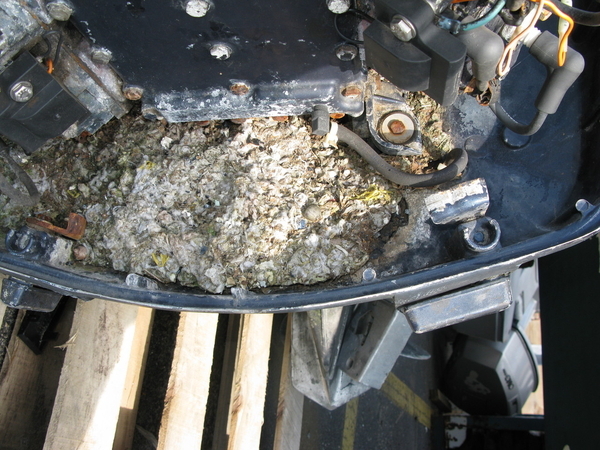 Look closely at the outboard above and you can see all the little shells and sea critters in at the back of the engine block. Click here to see a close up. The engine is now a write off and was caused by a combination of things. The engine was bolted onto the back of a sport fishing boat which sat at the dock for weeks at a time with no one looking after it, the boat had a leak in a skin fitting which no one noticed because any water that found it's way into the boat was sucked up by the automatic bilge pump. This leaking and pumping cycle went on until the battery went flat and the pump stopped working. The boat very slowly filled with water until the transom with the heavy engine on it started to sink. The water got under the engine cover and with it the critters started to multiply ending up with the situation that we see above. When salt water found it's way into the engine it was doomed and is as you can see a total wreck. All this damage and a 12,000 dollar repair and replacement bill could have been saved if the boat had been taken care of and the very small leak repaired. It seems that the EPA is suggesting an increase in the amount of ethanol in gasoline. Presently the limit is set at 10% but if the EPA has it's way this could increase to 15%. This may make sense from an environmental point of view, I for one am all for protecting the very places where we enjoy our boating but it appears that the EPA has not done it's home work with respect how this might impact boaters. While most outboards will currently run on gasoline with 10 % ethanol added some of the older motors in particular will have a hard time and may not run at all without significant modification which will be costly if it is possible to do it at all. Some motors will be rendered useless costing owners many thousands of dollars in replacement motors. Plus none of this factors in the difficulties that have ensued to tanks and hoses many of which started to degrade when ethanol was added to gasoline originally, any increase to 15% could cause additional problems in that area also. The NMMA (National Marine Manufacturers Association) is seeking a science first approach to allow more time to look into the issue and find ways to address the issue that will not damage an already struggling marine retail market. Many years ago when I had my first or second car I had to rebuild the engine and like many a teenager thought I knew best. It was only after I had rebuilt the engine that I found that I had several nuts and bolts left at the end of the project. The engine did run surprisingly, even without the missing bits and bolts though less well then it might had they been refitted. It seems in my haste to get on with the job I had just stripped everything down and thrown all the assorted components into a big box. The valves, pistons and springs were easy to identify but the smaller components presented something of a challenge, hence the errant nuts and bolts. never again I vowed would I ever make that mistake again so now as I take anything apart I am careful to tag all the parts and put smaller bits into plastic cups marking them as above with a magic marker. Even if the engine rebuild or whatever takes some months it is still possible to identify each of the components and make sure nothing is left out. It is also a good idea to take a few photos as you dismantle anything and now that small digital cameras are so cheap it pays to take plenty. It might just save the day for you when the time comes to put everything back together. The picture above shows my 40 year old Seagull forty plus engine which I bought for my first boat when I was still in high school. Thinking back the boat that I built all those years ago was pretty rough and has long since passed to the bonfire I shouldn't wonder but the engine soldiers on. I don't much use the engine now but on those occasions that I do put it to work it always starts on the second or third pull. The Seagull engine is simplicity itself and there are very few parts to wear out or replace but when I was casting around on the web the other day was surprised to find that there is firm called Saving Old Seagulls that has lots of spares at reasonable prices. John the guy that runs it seems to be a font of knowledge and can answer almost any question it seems. In all the years that I have had my engine about the only things that I have ever had to replace is the spark plug and the spring that holds on the prop. Interestingly Seagulls never had shear pins but instead had a large spring which you can just make out in the picture to hold the prop on. The idea was that it gave some measure of shock resistance should the prop strike anything. It must work because I think I have only replaced it twice in the entire time that I have had the engine. One of the reasons that Seagulls lasted so long was that they ran on a gas /oil mixture of 10 to 1 although a popular upgrade and one that I undertook was to change the needle in the carb allowing the engine to run on a 25 to 1 mix which is still pretty rich. This explains why if you don't hear the clatter of the engine you will surely see the plume of smoke rising from the transom of any Seagull powered boat. Anyway this weekend I got the engine out and dusted her off and had it running for while and I thought that I might just take her out for a spin on the dinghy when the weather permits. Incidentally I still have the original bill of sale, the engine cost $150 new. Well I am glad to say that after 10 days without electricity we are finally back into the 21st century. I have a lot of catching up to do, I am behind on my surveying book a little and there are a ton of other jobs that need attention but I have spent the day in the workshop prepping my 2hp outboard for the winter ahead. This is a picture of new one, mine is much more ratty than this but it is the same model, a Yamaha 2CMHS. Yamaha do still make this 2 hp two stroke engine but sadly they are no longer available to the US market, however spares are fairly easy to come by which enables me to keep the old girl purring. All too often outboards. irrespective of the size are forgotten about at the end of the season, they just get left on the back of a boat or put away in a shed somewhere and then are expected to start some months later when the weather gets warmer. Even if you do your boating in warmer waters where there is no off season a bit of TLC will do wonders for your engine and your temper. Much of this entails putting the engine to bed properly in the winter or storing it sensibly when it is likely to go unused for a period of time. Step one is to flush the engine through with fresh water, warm water and aluminum do not sit well together and salt water left in any outboard will lead to corrosion. A small engine like my diminutive 20 lb Yamaha will easily run in a trash can full of water but a larger engine can be run on a stand with a set of fresh water muffs feed from a hose pipe. Run the engine until hot then remove it from the water give it a good wipe down and then take it into the garage or whatever to take care of the other tasks. I was especially keen to get indoors because when I took this photo it was 20 degrees with snow on the ground.